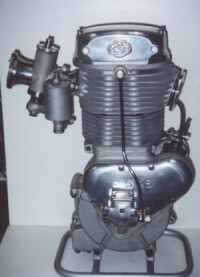 This is the DT5 model that housed the ESO S45 motor, a 500cc O.H.V. 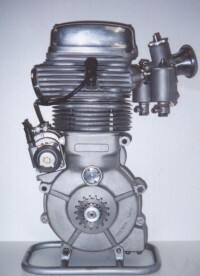 unit that develops 48.6bhp at 7,500 r.p.m. 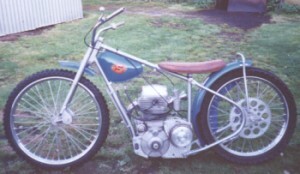 A 350cc was also produced for the Grasstrack market. 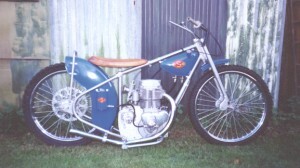 The first of the ESO machines appeared in Britain during 1961 when it was ridden by the great Ove Fundin, though he reverted to his JAP machines for the more prestigious meetings. It was Barry Briggs who later became the UK concessionaire at his Southampton premises for the complete Eso machine. The above picture comes from the Ian Patterson museum, whilst below are two shots from the ever growing collection of Rick Newlee in America. Latest addition to this page are photographs (Below) kindly sent to me by Ben Ludolphy and show an earlier 1955 ESO machine which has recently been lovingly restored by collector & restorer Noel Clark. As you can see, the machine is almost 100% original and requires only items such as the chain and grips on the handlebars to make the bike complete. The engine depicted here and in the photographs below, are of an original S45 type motor and is recognisable by the fact that there are only four stiffening ribs on the primary side of the crankcase. On later engines, six ribs were used whilst later still, eight were incorporated. Another recognisable feature, is to be found on the inspection plate on the valve cover. On this machine, the plate is a casting with the name ESO on it, later types, the name is engraved on the plate as on the machine at the top of this page. This engine also has a conical tapered crankpin with nuts, similar to the JAP engine, whereas later models have a parallel pressed crankpin. 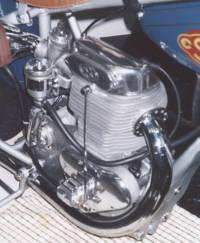 The early S45 engines were equipped with two types of carburettors, the 35mm Dell'Orto or with a carb that was a copy of the AMAL. This type was of Czech manufacturer but as yet we are unable to identify this particular carb type. 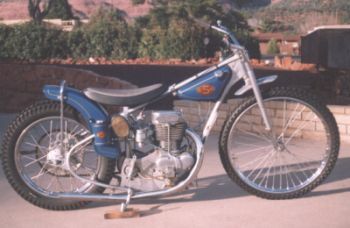 Whilst this 1955 ESO was built for speedway, it was also used for Longtracking hence this bike has a foot operated 2-speed gearbox, the lever for which is mounted at the rear side of the box. Another interesting feature is the forks. 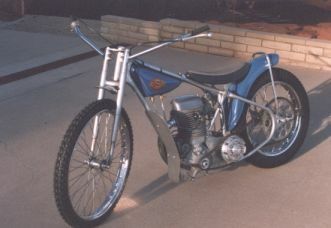 Some 35 years before they became standard on modern speedway machines, this bike is leading link type, with small rubber blocks inside. Also, the handlebars are not a solid piece type, but rather 2 clipons. Apart from being adjustable for height and position, they could be put along the frame for easier transportation, an important factor when most machines were transported in the boot of cars.